Double White is the signature beer from New York’s Southampton Publick House. This double strength witbier has a meager 18 IBUs and an easy drinking 6.6% ABV. Day five of September’s THEME WEEK has another year-round selection from New Belgium Brewing Company. Day 5′s brew: Mothership Wit. Mothership Wit is a witbier with a 4.8%. This organic ale is part of the “Explore Series” and is available year-round. 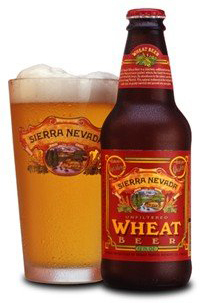 Sierra Nevada Wheat Beer is an American pale wheat beer with a 4.4% ABV. Sadly, this beer has been retired and is no longer being brewed.